I’m as close to the Spectrum as you can be without being diagnosable. . . or am I? Hi. My name is Schenley. Here’s a little bit of information about me that is relevant to today’s topic of discussion. Huh. I was a conscientious “good girl” too. But. . . why wouldn’t your Nancy Drew mysteries be lined up in numerical order? That just makes sense. It’s how it should be. All of my Animorph books were in order. I organized my collections, too. 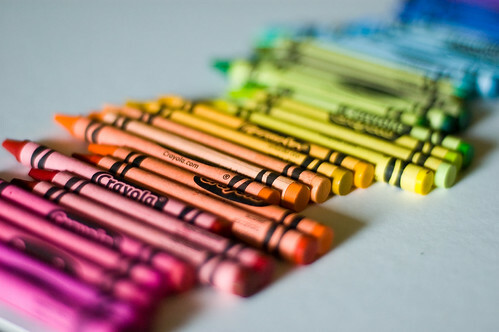 I remember having a case to sort all of my little colored erasers, and compulsively organizing Crayola boxes of 96 crayons into meticulous rainbow order. Everyone called me “shy,” too. The section called “Aspies at Play” – this is where things got intense. “God mode” – Wow. I know being bossy was my biggest social deficit as a kid, and I struggled for years to overcome it. It was tough. The difference between boys’ games and girls’ games – I always preferred things like playing video games with the guys (something I was good at) to role-playing with the girls. Playing with children as an adult (as a nanny, babysitter, or TSS) I am still that way. I thought it was just because I was a “tomboy” instead of a “girly girl,” but it’s more than that. “isolation, bullying and depression” – words I know too well. Seeing this chart sealed the deal. I quickly showed it to people closest to me. My mom is certain that if there had been more awareness, I would have been diagnosed as a kid. Thus began my quest for more knowledge and self-understanding, reading blogs and books about women with Aspergers. Reading the blogs, I’ve been going back-and-forth on the idea of starting my own blog. Do I want to let people I know deeper inside my heart and head, or would I want to write anonymously? Would I even be able to write honest, detailed posts without giving away my identity if someone who knows me read it? Do I have anything worth saying? Could it be therapeutic to write, anyway? Do I really have the time to take on yet another project? And I’ve decided to not try to hide my identity as the author of this blog. Most of my life as an undiagnosed Aspie has involved feeling invisible. Feeling like I had to hide my true thoughts and feelings. What good has that done me? It’s time to be real. I’ve always been an honest person- I’m an Aspie, after all – but too often I’ve held my tongue or stayed hidden. So like she says in this video I watched recently – I’m coming out of the closet. Want to read my blog? The second half of November posts as well as the winter month ones are like you like. Just click the label Aspie life when you follow the link to my blog, if you ever see this comment and decide click my name which is the link.